Are you reaching a more mature stage in life and looking for a new relationship? Are you tentatively returning to the dating arena following the end of a relationship? Do you want to successfully find the man of your dreams and avoid the many pitfalls? 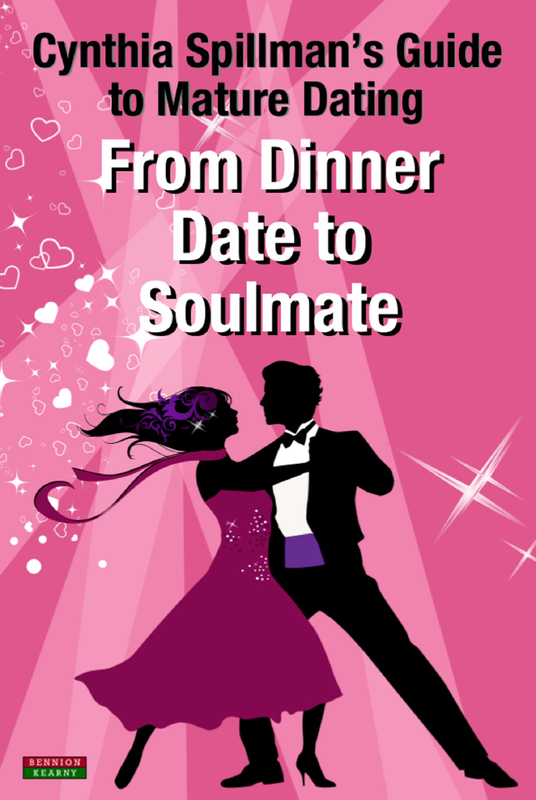 Written by international dating coach Cynthia Spillman, founder of The International Dating Academy and formerly the Chief Executive of Dinner Dates, From Dinner Date to Soulmate is a humorous, practical, and inspirational handbook for the growing mature dating market. Part One – Get to truly know yourself, and Apply the FLY (First Love Yourself ) principle before searching for a partner. Part Two – Know where to look for potential partners and Action this knowledge. Part Three – Move from first date to soulmate and Live happily ever after. From Dinner Date to Soulmate is an empowering, witty, self-help book, targeted at the large number of women who have been single for years, or who are divorcees or widows. This book will guide and inspire them on their quest for a new soulmate. Are you sick to the back teeth of searching for Mr Right, and forever ending up with Mr Wrong? Do you feel despondent, weary, and about to throw in the towel? If so, this is definitely the book for you. My motivation for writing this guide to love at any age was fuelled by a profound desire to empower women to dig themselves out of mental apathy and deliver results-orientated action. This is a road map for women who find themselves, for whatever reason, searching for a partner in mid or later life. I know it’s not always easy. I married my third husband, Peter, when I was 48. For many years, I was the Chief Executive of Dinner Dates, the UK’s longest-established networking organisation for high-end professional single people, and I had countless experiences of helping women to find love. In turn, after Dinner Dates, I set up The International Dating Academy, a one-stop-shop, for people who want to improve their dating skills. These two businesses have put me in a unique to position to help older women find long-term contentment with the right partner. Like many women, I have (in the past) found myself to be “relationship-challenged”. In other words, we keep banging our heads against a brick wall in our love search, to the point where we really start to believe that we’re going to end up lonely old ladies with cats for company. We’re human and we make mistakes, and as we age it can feel petrifying even to contemplate re-entering the relationship jungle. When you’re in the jungle, you need a guide. After a considerable amount of research, I realised that there’s a dearth of mature dating self-help books for women. I decided that the time had come for me to produce my own route map for women; after all, I’m only too familiar with how jaded and disillusioned we can become when we’re searching for love. I come at this book from an empathetic and compassionate heart set. I’ve walked the walk and, in mid-bloom, am blossoming more than ever before. Asking for help is a sign of strength, a real badge of courage. You outsource your tax affairs to your accountant, or you work with a personal trainer – well I’m a personal trainer for people looking for love. There’s an effective and a mindful way of going about the search for a partner or a slap-dash, hit and miss approach. I hope you opt for the former! Your time is valuable, and your happiness is precious – so please make space in your busy schedule and join me on this awesome journey. It’s my mission to help you overcome your fears, frustration and apathy, by providing you with a clear blueprint for the journey to finding and keeping love – at any age. This book is dedicated to single women, separated women and widowed and bereaved women of all shapes, sizes and life situations. Perhaps you’re already enjoying a great life, and the cherry on the cake would be finding a fabulous man to share it with. Maybe you’ve been so badly hurt by a previous partner that you’ve shied off ever being intimate again – yet in your soul, you instinctively know that love heals all pain. Dare to try again. Or perhaps you’ve been way too consumed by building your career to have found the time to seek love actively. You may even feel that love has passed you by and that it’s too late. Nonsense! It’s never too late. There’s always hope, and in the following pages you’ll find answers, as well as facts and figures, which will shake your misconceptions to the core. Prepare to be challenged, as I deconstruct the many myths which lurk in the way of the mature woman finding relationship joy. Fundamentally, happiness is an Inside Job. I’m going to lead you through a comprehensive three-step journey which will dramatically increase your chances of reaching your intended destination: love and emotional enrichment. Part one, step one, “Be prepared”, is all about preparing yourself for love because, if you’re not happy in yourself, you certainly won’t find contentment through a man, nor will you attract the right partner for you. By doing the Inner Work, more than anything else you do, you will not only feel happier in any event, but you will bring about a quantum improvement in attracting the kind of man who’s actually right for you. Without doing the groundwork you could register with every online site in the world, you might well meet men, you will probably have dates… but will you find a soulmate and live happily ever after? I don’t think so! Part two, “How to find potential partners”, shows you where and how to find the man of your dreams. It provides you with a multifaceted approach to finding The One. Part three, “Moving from first date to soulmate”, spells out the vital ingredients for lasting relationship success. My mature dating methods are tried and tested. This isn’t a book which is to be read and then stuck back on the shelf without further action. When I work on a one-to-one basis with clients, I use a systematic approach; as you and I are not face to face, I’ll adapt the way I work so that you too can benefit. This book is also unique in two further ways, both of which are extremely relevant to mid-lifers. I dedicate an entire chapter to loving again after loss, be it following on from separation, divorce or widowhood. Having the ability and tools to do this, and to make space for new love, is crucial. I also include a section on practising relationship mindfulness. Mindfulness is the new buzz word of our decade. Far from being the latest wishy-washy New Age fad, it’s a scientifically-proven mechanism for fostering inner growth. Mindfulness is powerful, yet simple – a transformative tool in our emotional and spiritual bag of tricks. Note that when I employ the term “spiritual”, this is absolutely nothing to do with religion, rather a change in the way we learn to perceive the world, and each other. To the best of my knowledge, there’s no other dating skills book of this kind, encompassing both aspects. Labels are for jars and not people. You’re not past it, no matter what figure your birth certificate may state. I promise you that if you accompany me on this journey to love, and you follow my suggestions and take continuous action – you too will be rewarded with the enormous joy that I (and many people that I have coached) have found. It’s our birthright to live, and love, outrageously. Grab your courage with both hands, and enjoy the mature dating ride!